A follow-up of sorts to Secret Stash's venture to Peru where label owners dug up obscure funk and soul from around Lima, where they most likely ran into so much more music as they compiled this release as well. Afro-Peruvian music is one of the most elusive genres in the world. Not only is it practically unheard outside the borders of Peru, but even the people of Peru are unsure of many aspects of its history. The roots of this music date back to the mid 1500s, but over time the Afro-Peruvian culture and its music faded. So much so that by the mid 1900s, most remaining black Peruvians had never even seen a Cajon (a wooden box drum that is the definitive Afro-Peruvian instrument). From the mid 1950s through the 1970s, Peruvian labels such as El Virrey, IEMPSA, and Odeon supported an Afro-Peruvian revival with the release of hundreds of Afro-Peruvian albums. Today Salsa and Rock music rule the airwaves in Peru, but Afro-Peruvian music is far from dead. 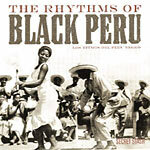 The Rhythms of Black Peru is a collection of some of the most important Afro-Peruvian recordings of all time. It includes some of the most prolific figures in Afro-Peruvian culture such as Nicomedes Santa Cruz (credited by many as the most significant person in the Afro-Peruvian revival), Chabuca Granda, and Zambo Cavero. This vinyl-only (+MP3 download card) compilation is pressed on white and black splatter wax and is the perfect introduction to this percussion driven fusion of African rhythms and Latin melodies.